Whether your machine shop is used for metal working, manufacturing, a truck or auto repair shop, we have the building for you! Custom design your building kit to include features which not only meet, but exceed your requirements for a machine shop. Sturdy, easy to construct and with little overall lifetime maintenance, a commercial shop building kit is the solution for heavy duty use of a commercial building. Insulate the walls for a comfortable working environment. Proven noise reduction and assistance with consistent temperature regulation are a bonus. Hansen metal building kits include a reflective insulation which also acts as a vapor barrier, to eliminate condensation issues. 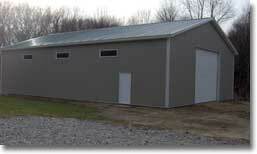 You will be surprised how much “building” you can get for the price on a machine shop! 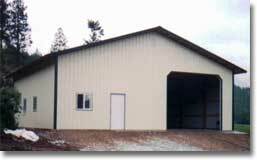 Stick to a width 60’ or less and make your commercial building kit as long as your property and pocketbook will allow! Don’t like those unsightly roof vents which just seem to leak no matter how many times you caulk them? Keep it simple. Include our premium ridge vents with your building kit. Add vented overhangs for a complete air flow system, while creating a “finished look” to your machine shop. Enclosed overhangs will also keep the snow and weather away from your building, adding to the lifespan of your building. Is your auto repair shop or repair shop located in a part of town deserving attention to curb appeal detail? Building kits can be dressed up in so many ways. It doesn’t have to have the old “industrial” look. To begin with, Hansen building kits include trim for all exposed wood. No paint to peel or wood to replace, ruined by exposure to the elements. Wainscot dresses up the bottom portion of the building, while giving the illusion a tall building is not quite….so tall. Steel 3’ panels also afford quick and easy replacement, should one accidentally get damaged by a lawnmower or other vehicle. Rock or brick wainscot options turn a plain building into an upscale machine shop. Cupolas with weathervanes are an attractive addition to your commercial building. Line the interior with steel wall panels for durable and easily cleanable surfaces. Choose from 17 colors for the interior liners, lighter colors promoting maximum light reflection to cut down on lighting costs. What size doors does your machine shop require? We can get just about any size commercial overhead you desire. If you need a hydraulic or bifold door for your machine shop, the roof system will be designed for just about any hanger door type assembly. Entry doors can be 3’, 4’ or 6’ with a removable astragal (the middle support) for full access. All entry doors Hansen uses are always commercial grade with all steel jambs and are factory painted, not just primed. Don’t get caught with wood jambs which can rot, requiring replacement, or cause the door to stick.